This inter-galactic romp has everything: tough choices, talking cars that fly, heroic boys and girls, kidnapping, battles with formidable foes and dissention among internal ranks. There’s action-a-pace, annoying siblings, dodgy friends, heart-stopping adolescent moments of infatuation and, of course, planets made entirely of food. 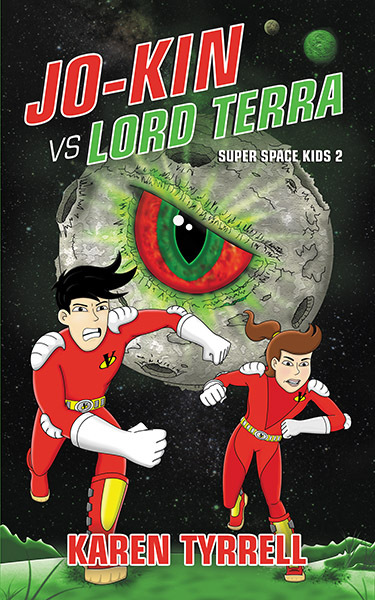 Jo-Kin vs Lord Terra contains a smattering of many issues that will be familiar to its 7-12 year old readership, touching on ideas of doing the right thing, standing your ground, teamwork, friendship, problem solving and resilience. There’s a lovely light, humorous touch throughout and although one or two rogue words have escaped the editorial process, overall it’s a happening and pacy read (although I have to personally admit finding it hard to get into – middle-aged woman that I am!). With enough computer game terminology to engage both boys and girls, it’s also appropriate for reluctant readers. Review of Jo-Kin vs Lord Terra kids FUN space adventure. PS Loved your tags of Friendship and infatuation too.